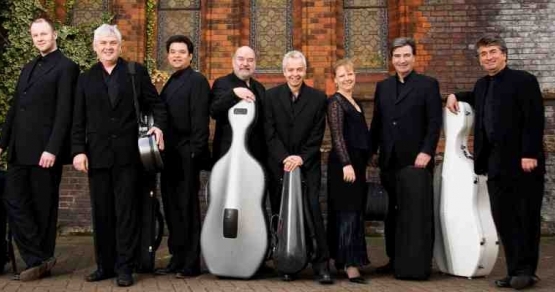 The Academy of St. Martins-in-the-Fields Chamber Ensemble, Works by Brahms, Shostakovich and Mendelssohn, Vancouver Playhouse, September 27, 2011. Few classical music ensembles have become more of a household name than the Academy of St. Martin’s-in-the Fields. Started in the late 1950’s as a small, pioneering baroque orchestra under (now Sir) Neville Marriner, the group eventually expanded out to a full orchestra of 48 players, producing an unprecedented number of distinguished recordings of everything from Bach to Stravinsky. The ‘chamber ensemble’, formed in 1967 from the orchestra’s principals to play works requiring from 5 to 9 players (quintets to nonets), has had an equally enviable record, providing pristine performances of just about as wide a repertoire. Their recordings from the late 1970’s through the mid-90’s for Philips and Chandos often set new standards, combining great insight and sensitivity within a wonderfully warm and jeweled tonal fabric. This concert was the first of eleven concerts to be given by this ensemble in their current North American tour. The group’s members have naturally changed over the years, but three remain from the 1980’s (notably cellists Stephan Orton and John Heley) and the very capable guest leader, Andrew Watkinson, comes from the same performing tradition. I was quite thrilled at the opening of the Brahms Sextet No. 2 when all the hallmarks of the Academy’s sound and style were still in place: elegant and refined, but always rhythmically buoyant and structurally aware. The symmetry of the down-bowing and the tightness of the pizzicatos were pure Academy. The performance of this sextet was really quite special, identifying the scale and intimacy of the work perfectly and clearly differentiating it from the composer’s more expressive first Sextet. The ebb and flow of the first and last movements was captured with great sensitivity and a sense of unity, and the contrasts in the scherzo were handled with sophistication. Throughout, one noticed many quiet moments where the exchanges between the instruments, and the sheer beauty and shape of the phrasing, evinced a deep appreciation of this work. Mendelssohn’s Octet is by far the most famous String Octet ever written, an amazing work for one still only in his teens, often inviting comparisons between the composer and the young Mozart. It is also fun to watch: many times Mendelssohn will start a phrase in the cellos and one can literally see it being repeated by every player as it moves across the group to the first violin. The work (and especially its Scherzo) has always been a signature piece for the Academy; their first recording on Argo dates from the 1960’s. They must have played this so many times that, at least on this concert’s evidence, they now regard it as a more serious and sober work; its youthful fire no longer burns as bright. Certainly we heard a well-structured performance, with considerable momentum in both first and last movements and sensitive playing in the Andante. But it was more of a conscientious effort than one that breathes charm, delight or romantic ardour. The famous Scherzo had a vivacious bounce and projection before; now it is plainer and possibly more laboured. Perhaps the dry acoustic of the Playhouse had something to do with this: the sound was thinner and more ‘grounded’ than I expected from this group and, surprisingly, the leader’s tone sometimes had difficulty in projecting over the general ensemble. The competition in this work indeed comes from very close quarters: the Academy’s own 1979 Philips recording under Iona Brown, a sparkling reading that seems to get everything right. Also interesting to hear the ‘octet’ version of the young Shostakovich’s Two Pieces for String Quartet (1925), with its remarkably uninhibited and innovative Scherzo, as the concert opener and a somewhat strange, but effective, twelve-tone version of the song ‘Summertime’ as an encore.